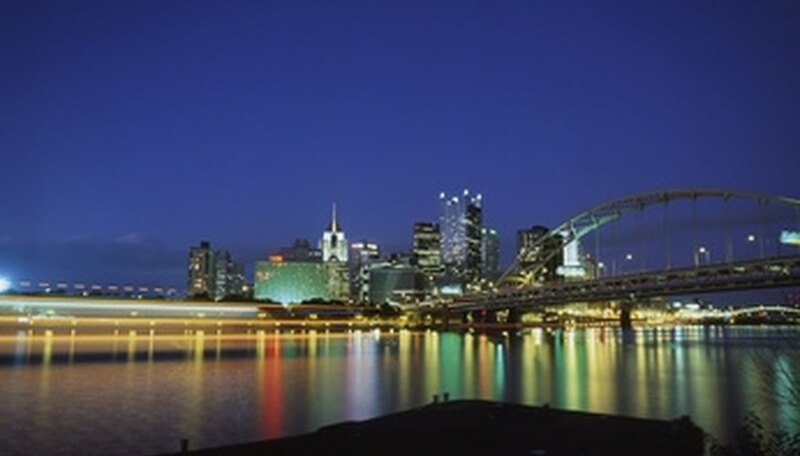 If you hope to woo your special someone with romantic night out on the town, Pittsburgh is your place. From the heights of Mount Washington to the riverfront views of Station Square, Pittsburgh is full of sights that inspire romance and whimsy. The city's most charming locales are home to restaurants where couples may enjoy not only the views and the food, but each other's company, too. Restaurants across Pittsburgh feature romantic views and fine dining. A former railway complex, Pittsburgh's Station Square is now a destination for shoppers, tourists and diners. The historic centerpiece of the area is the Grand Concourse, a restaurant featured in such movies as "Flashdance" (1982) and "Dogma" (1999.) This restaurant occupies the former Pittsburgh and Lake Erie Railroad station, and still houses many of building's art deco features. With marble, colored glass windows and ornately carved wood stretching from the rounded booths to the high arched ceiling, this restaurant is a one-of-a-kind Pittsburgh institution. For guests more interested in the sights outside than inside, its intimate River Room features booth-side views of the nearby Monongahela river---just be sure to make a reservation for this popular dining area. Guests looking for a romantic morning-after meal may also enjoy mimosas over the Grand Concourse's weekly Sunday brunch. Not only is LeMont Pittsburgh's only five-star restaurant, but it also features what may be the most picturesque spot in the Steel City. Atop Mount Washington, LeMont's wall-sized windows give patrons an unrivaled view of downtown, Point State Park and all three rivers that course through the heart of town. With a business casual dress code and menu prices well into the double digits, LeMont is well-suited for special occasions like Valentine's Day or even wedding proposals. For whatever happens after a mountaintop engagement, LeMont also hosts special events and wedding receptions of up to 250 people. Named 2007's Best New Restaurant of the Year by "Pittsburgh Magazine," Nine On Nine is a chic date spot in downtown's cultural district. Ideally situated for a romantic night at the theater, ballet or symphony, Nine On Nine features a calm, plush aesthetic of deep blue and pearl. Patrons may enjoy original cocktails like the house-made sangrias or even a bottle of Japanese Sake. You also have the option of reserving the Chef's Table for a secluded, romantic evening---with the restaurant's chef as your only company, you and your date can watch him prepare a nine-course meal just for you in a private kitchen. Despite the four-star atmosphere, no jacket is required, making this a popular spot for late night cocktails to cap off a summer's evening downtown. Ryan, Tom. "Romantic Restaurants in Pittsburgh." Dating Tips - Match.com, https://datingtips.match.com/romantic-restaurants-pittsburgh-5998287.html. Accessed 20 April 2019.